If you were a fan of Feathered Mason’s 2017 release ‘Mary’s Kitchen Sessions,’ you will find something to like in his most recent offering. Whether you like it more or less will speak to your preference in production values more than the songwriting or performances on ‘Limbo Boy’. For the uninitiated, a brief overview seems to be in order. 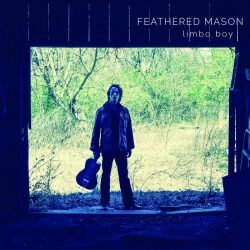 Feathered Mason serves up an interesting proprietary blend of hill country blues. Instrumentally, his music is grounded in the tradition but never shy about breaking away when that’s what’s called for. Lyrically, the songs are poetic and intelligent. ‘Mary’s Kitchen Sessions’ was, according to the artist, “recorded live in a cabin… on a few cold winter evenings.” The latest album was captured in the studio. The former features the artist performing solo on guitar, banjo, or resonator (save for the rare assist from harmonica or organ). The latter has the artist working with a full rhythm section and keys on every track (with the odd harmonium, pedal steel, or violin added in for good measure). ‘Limbo Boy’ maintains a heavier and darker tone as it moves through five tracks that survey a bleak landscape in search of something worth pursuing. ‘Skeleton Song’ and ‘Mausoleum’ express frustration with unsatisfying day jobs, industry profiteers, and a culture that sleepwalks through nostalgia. ‘Sisterworld’ yearns for a way to trade it all in… even if the only alternative is embracing the unknown. ‘Get Right‘ sets its eyes on paradise in the afterlife… regardless of who we’ll find sitting at the head of the table when we get there. ‘Loose Shoes’ is a strong capstone for the album. Where the other songs pursue escape, it seeks reconciliation with a lost love. In doing so, it seems to suggest that at the end of every long road through the darkness, we will find ourselves coming back into the light and ready to give the world we know another try. If you’re the kind of reader who leans toward Steinbeck, you’ll probably find yourself favouring the stripped down, raw, and direct version of Feathered Mason that you find on ‘Mary’s Kitchen Sessions.’ If, on the other hand, you prefer the imagery of Faulkner, then you will likely be drawn to the new album. Just as you will find great stories underneath the different approaches of those two authors, you can count on finding solid foundations beneath the songs on both albums. "All Kinda Ways People Feel Empty These Days"